Being uncomfortably hot, sweaty in places you didn't know you could sweat, and no prospect of getting cool anytime soon isn't an enjoyable experience. My choice wouldn't be to say "hey, let's go camping now that the temperature has reached 40 degrees". I would probably say "let's stay home" but it may not always be an option. A camping holiday planned for weeks might just have to go ahead, and you need to adapt to the weather conditions. And let's remember the plus side of summer - the beautiful balmy nights it can give us, with perfectly clear evening skies! But how can you make those warm days more bearable? Less likely to feel miserable in the heat? We put together 7 tips that can help alleviate some of the heat you might be feeling or at least help make camping a little cooler for everyone present. When setting up a campsite, you need to look at a number of factors. To help keep you cooler, remember to check the location of where you plan to set up – look to place your accommodation for the night in the area where it will get the most afternoon shade. Don’t forget that what is shady at 10am is not like that at 3pm. Near water? Position your camping site to maximise any benefits from breezes coming off the water. The downside about being near water is that it may increase the level of mosquitoes near your camp, so you need to weigh up your options and work out if you want breezes and bugs. When setting your tent up in this shady spot, remember that camping under some of our large gum trees can be very hazardous. Choose your trees wisely. Our smaller dome tents, without the fly, gives us, a mozzie-free night, as we are enclosed all in the mesh, and with total view of the night sky. This maximises the ability to get cooler air into the tent. These tents are a great choice for hot weather. If you are travelling in a bigger tent, then your options to leave the fly off may not be possible or may not result in significant changes. Ensure you open up all doors/windows on tent to maximise cross breezes, and set up the tent as late as possible (ie. when the sun goes down) to avoid heat building up in the tent. Nylon tents heat up more quickly than canvas tents, though nylon allows the air to escape more easily too. Lack of air circulation makes a hot night unbearable. The movement of air, though not cooling the air itself, will help you as the air circulates. They range in price, and are available at auto shops and 12 volt specialist companies, but from what I read, to get a good one (works efficiently, silently and economically) will cost. A recommended brand by others for caravan use seems to be the Caframo Sirocco . Hunt around though for the best deal with this product – purchasing from the USA might be cheaper. For a cheaper option, you could look a Companion Tent Fan with LED Light - that will help circulate the air in the tent, plus does something else! 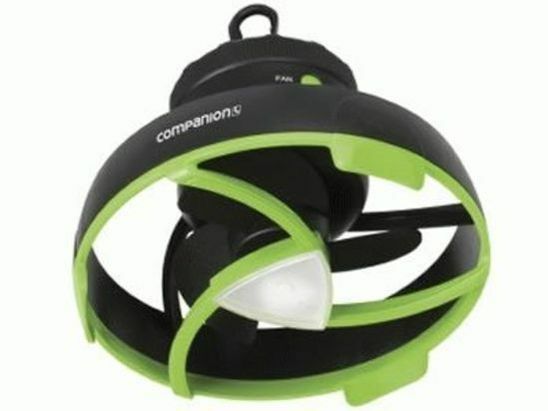 The fans designed for camping (and requiring batteries) means an additional cost to you; that is something you need to take into consideration when buying, especially if they are not rechargeable. It depends on how much you want to spend on powering these fans, and how long you want to run that fan for - battery life will vary based on run time and settings. Investigate! Of course there is always the option of getting a 240w fan, and using with an inverter – they generally are larger fans, and therefore going to greater breeze but if its suitable for you will depend on space, portability and if you have the necessary accessories to power it. Looking to maximise the cooler nights? Then hammock camping is an option to think about. If no hammock, sleeping under a tarp another option, though bugs could be an issue! If you are looking for other sleeping options - a camping stretcher/cot allows air to circulate under the cot, instead of a mattress. You may find it cooler being a little elevated/off the ground. If you have this option, another way to help reduce heat on your tent, is to string a tarp over the tent, leaving enough room for air to circulate between tent and tarp. It provides another layer of protection from the sun. A little bit more work, but the benefits will be noticeable. In our previous story on camping in summer, we emphasised the need to bring water and more water. It’s timely to include this fact again as a way to keep cool. Plenty of water as opposed to soft drinks, caffeine and alcohol will help keep you hydrated. Not near the ocean or a lake? If space allows, a small blow up pool filled with water is a great way for children (and pets) to keep cool. If it gets too hot, you can join them! Proper clothing for conditions should include cotton clothing, light coloured (to reflect the heat), wide brimmed hats and adequate sun protection for the body. There are clothing items that draw sweat away from the body, and have built in SPF protection – worth investigating if hot weather camping is going to be on the itinerary. If you are camping near water, your time will probably be spent in it! That would be the best way to keep cool and one of the only reasons I would be found in a tent in summer – because we have a major water source right next to me! If you don’t have a lake or ocean to laze by, your activities need to be altered to suit the weather. Early morning starts for any activity, so you can rest in the heat of the day. If you have access to air conditioned locations (shops, tourist attractions, caravan park facilities) utilise them in the warmest part of the day, so you are not sweltering at your campsite. We camped in the Northern Territory, and remain very thankful that Kings Canyon Resort had a swimming pool where we could spend the afternoons! 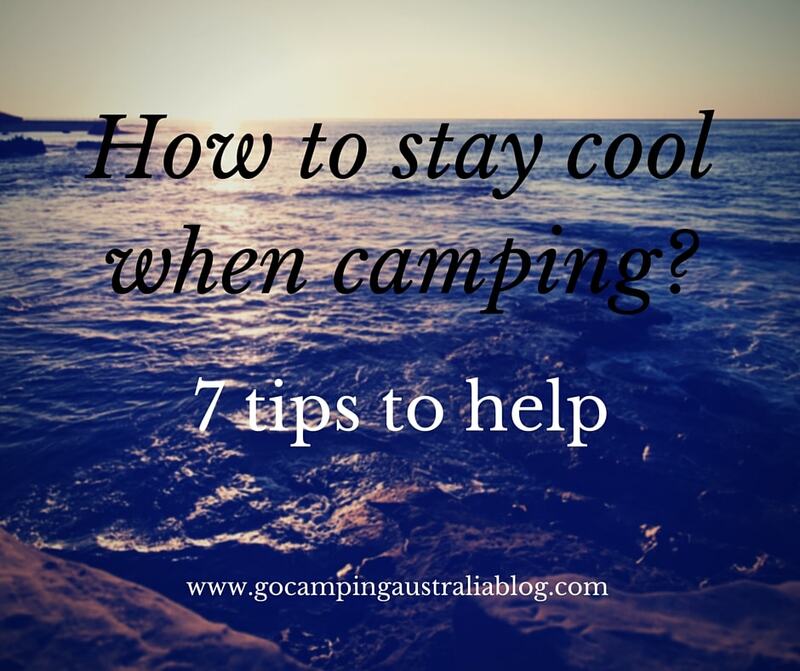 If you are heading out camping this summer, hope these tips make your camping experience a bit cooler. Further information on summer camping and how to keep food cold when camping will help too! Editors note: This story was first published in 2014 and has been updated to provide accuracy and comprehensiveness.